PSCWB issued a notification related to the fresh recruitment process under Government of West Bengal. Public Service Commission Recruitment department of WB Government is looking to fill up 74 vacant positions of Motor Vehicles Inspectors. Only those applicants are eligible to apply for this PSC Recruitment who have passed in their Graduation under any stream. There are few more conditions which candidates must full fill before applying online. Those all conditions we explained below in this job posting article. Read it carefully before applying online for these Government jobs in WB. We took this information from the PDF file shared by the department on the commission website. So all the rights related to the information which we shared in this article goes to the official PDF file. We also shared the reference link related to the advertisement detail under IMPORTANT LINK section at the Last of this article. Pay Band: Rs.7100 -Rs.37600 + GP Rs.3900 Per Month. Educational Conditions: All Fresher candidates who have passed in their Graduation from a well-recognized University of India can apply for these Govt jobs in WB state. Those who lies in between these age limit can apply online for this PSCWB Recruitment process 2019. Age will be calculated on the basis of following date: “1st Jan. 2019”. Paying Method: You have to pay the examination fee through the Online Method: “ Credit Card/Debit Cards/Internet Banking”. You can also use Bank Challan at any branch of UBI bank for the payment of the application fee. Process for applying these Govt jobs in WB is online through the official website of the department. Government job Applications can be submitted through the Commission’s website whose link is : “http://www.pscwbapplication.in”. The process for Filling up of online application from will be commencing from 27th January, 2019 to the Closing date for receipt of online application. The closing date is 17th Feb. 2019. Soo all eligible candidates needs to apply online between these dates. 27TH Jan. 2019 is the Starting Date to apply. 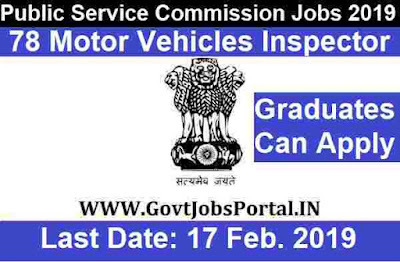 17th Feb. 2019 is the Last Date to apply.